With its ski-in and ski-down location to the chairlift at Fernie Alpine Ski Resort, this Fernie ski accommodation offers 3- and 4-bedroom units. 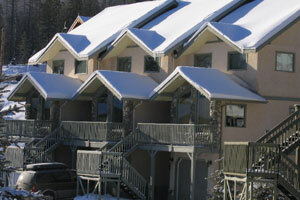 Thunder Ridge Chalets are nestled among the trees alongside the ski trail at 5304 Highline Drive. Each chalet offers unique design features and fine interior touches and amenities. Contact us for more information or to make the Thunder Ridge Chalets part of your Fernie ski holiday.